VASCO Data Security International, Inc. (NASDAQ: VDSI), a global leader in authentication, electronic signatures, and identity management, today announced two new DIGIPASS® Authenticators with Bluetooth capabilities. The DIGIPASS 875 is a smart card reader solution, and the DIGIPASS GO215 is a compact, one-button device offering powerful, portable and flexible two-factor authentication and digital signing. Both devices provide enhanced security for the growing number of mobile devices such as smart phones and tablets. VASCO DIGIPASS 875 is suited for environments with high security and convenience requirements such as internet banking and e-commerce. It offers WYSIWYS (What You See Is What You Sign) functionality that allows the user to see the transaction amount and account number before they electronically sign a transaction. This protects against Man-in-the-Middle attacks, a common attack method used by hackers. DIGIPASS 875 supports mobile devices across multiple platforms including iOS, Android, and Windows Phone, and it can be used with multiple card formats. DIGIPASS GO215 can communicate with any Bluetooth Smart Ready mobile device. 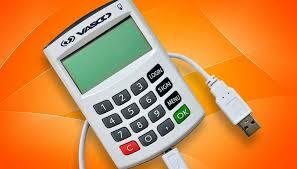 It provides a positive and frictionless user experience and enables a higher level of security for mobile banking. The DIGIPASS GO215 instantly creates a virtual secure channel between the host server and the mobile device to secure communication between these two. A single push of a button generates a One Time Password to secure access and transactions. In its connected mode, the GO215 offers electronic signing for additional transaction security.